CCE's EnSuite Announces another Blockbuster ReleaseLatest CAD versions, improved rendering, parallel processing support and more! FARMINGTON HILLS, Mich. – (May. 10, 2017) – CCE, a leading provider of advanced interoperability software and engineering services, just announced a major update of its flagship CAD viewer and translator software, EnSuite. Continuing its tradition of providing rapid support for latest CAD versions, EnSuite just added support for CATIA V5-6R2017 (R27). This is in addition to latest versions of all major CAD systems it already supports, like SOLIDWORKS 2017, NX 11, Autodesk Inventor 2017, and Solid Edge ST9 among others. EnSuite also made some significant improvements in rendering quality in its viewer application by utilizing GPU hardware acceleration capabilities. This, in conjunction with, parallel processing support in the Batch Translator application, affords a much faster viewing and translation experience than earlier. 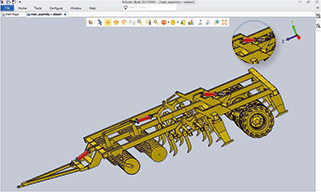 Flexible sub-assembly is an important concept in CAD whereby it allows movement of individual components of a sub-assembly within the parent assembly. This recent update of EnSuite now supports flexible sub-assemblies in its viewer application and displays repositioned instances of a sub-assembly in the same way as it is displayed in native CAD systems. "EnSuite is our marquee viewer and translator software. We continue to make investments in the product with meaningful updates that will significantly improve efficiencies of our users while providing them with the latest functionality in the marketplace. There simply is no better CAD viewer and translator product in the market today," said Vinay Wagle, Vice President of Sales and Marketing. 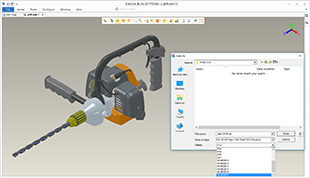 EnSuite is a stand-alone software used to view and translate 3D CAD data and provides quick access to critical engineering information residing in CAD files, no matter which CAD system was used to author the data. EnSuite is completely CAD-independent and can be used across the extended enterprise without incurring costs associated with expensive CAD licenses. The software works with all major 3D CAD formats, including CATIA V4, CATIA V5, CATIA V6, NX, Creo, SOLIDWORKS, Autodesk Inventor, Solid Edge, Parasolid, JT, ACIS, CGR, STL, 3D PDF, Rhino, IGES, and STEP. For additional information, please visit the EnSuite product page.